Final Fantasy XIII is perhaps the largest step the franchise has ever taken away from what it is known for. 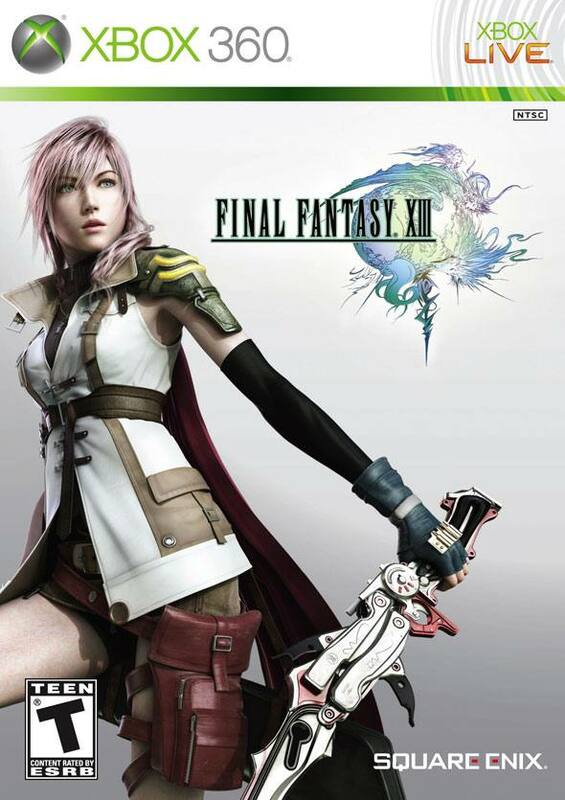 Moving to both the Playstation 3 and Xbox 360, the story is a complex and original tale developed by the long-time RPG creators at Square Enix. The story follows six survivors of the Purge, a government movement meant to eradicate civilians who came in contact with a “Pulse Vestige.” Pulse and Cocoon, humanity’s home world, went to war hundreds of years ago, and many Cocoon residents fear Pulse’s return. The six survivors all gather at the Vestige, where they are turned by the residing fal’Cie, an entity beyond human comprehension, into Pulse l’Cie, feared servants of the fal’Cie. They are left with a vision of the destruction of their home planet and are sent to fulfill a mission they cannot understand. Players will follow all the characters, who split up and regroup at various points throughout the game. The background to the game is crucial, and players may find themselves consulting the Datalog option in the main menu quite often for information. The Datalog contains updated information on the thirteen days that lead up to the events of the main characters’ l’Cie transformation, along with information on historical references, enemies, locations, fal’Cie, and more. The fact that the game forces players to read what should be spoken may frustrate some gamers, and with so many twists in the game, the goal may become confusing or even muddled underneath it all. Still, the main storyline packs a punch, and while it drags on throughout much of the beginning, once it picks up it doesn’t let go. At its core, it is an emotional tale of survival, and players will enjoy watching the characters transform over the course of the game. The first thing nearly every gamer will recognize about the game is its phenomenal graphics. The characters and scenery are simply stunning, and the mixture of places visited, from thriving cities to mechanical waste dumps, are beautiful to behold. The soundtrack of the game is equally astounding, having a very dramatic musical theme. Voice acting is also quite good, though Vanille’s voice has received criticism from many gamers. Whenever she is attacked or upset, she groans and moans, and the T-rated game suddenly takes on a more mature edge. Teenagers should not feel embarrassed for playing the game, yet many boys will chuckle or snicker at Vanille’s rather obnoxious battle attacks and moans (it being so obvious that reviewers feel the need to comment on it). With such beautiful landscapes, many gamers hoped to explore the world of Cocoon. However, Square Enix has severely limited the players’ ability to travel. Maps are about as linear as one can find; often players are literally going in a straight line from point A to point B with only a couple fights and items laid out before them. Out of a total of thirteen chapters, players will only be able to go back to Chapters 11 and 12 once they reach Chapter 13, meaning that most of the places players visit will be a one-time event. This is deeply disappointing, particularly because it creates a limit on side-quests, which are rarities within the game. For a series that usually makes side-quests fun and challenging undertakings, Final Fantasy XIII falls far short of this expectation. Most side-quests are only available in Chapters 11 and 12, and many are recommended only after beating the game. The battle system is nothing like previous installments to the series. Up until much later in the game, the computer chooses who you will control and who will be in the party, forcing you to try out all characters at one point or another. Only one character in the party can be controlled as well. Furthermore, for the first several chapters, there is no leveling up. Once the main characters become l’Cie, they gain what is known as the Crystarium, a level-up system that is just as linear as the map system. There are three main roles each character is given depending on their unique abilities in battle, and each character levels up these roles in different orders. It is a basic system; characters gain experience from battles and use it to gain one crystal sphere at a time. Spheres range from abilities to accessory slots to generic stat improvements. Rather than liberating characters, the Crystarium feels very restrictive to players’ abilities, for it only expands, allowing for higher levels, at key points within the story. Therefore, players can only max out their characters to specific points before having to wait until an important boss later down the road before they continue training. Given this restrictive setting, strategy is a much more important feature of the battle system. Battles are very fast-paced and require what are called Paradigm changes. Paradigms are different sets of roles that characters are assigned, and these roles can be shifted in the course of battle in order to use different strategies. These range from having all-out frontal assaults to defensive and medic sets, allowing for swift changes in strategy should something drastic happen (and it often does). Even Eidolons, which are brought back in a new way, follow this emphasis on strategy rather than brute force. Each character receives a specific Eidolon at crucial points throughout the game. In order to receive it, however, players must fight the Eidolon and fill a bar by using various techniques, some of which include not attacking at all. Eidolons also cast Doom, turning battles into a race against the clock. Once obtained, they do very little damage overall, and while they can change into various forms throughout battles, it feels as though Eidolons are around to show off more than to do damage. This emphasis on strategy rather than statistics falls in line with the simplistic level-up system, but it can make for some very frustrating experiences, particularly with bosses. Final Fantasy XIII is a beautifully complex game, yet it has its share of flaws that will irritate old-time Final Fantasy fans. The battle system is completely different from anything seen before, and the linear gameplay, along with a lack of side quests and exploration, is a disappointment. The game looks and sounds striking, and once they have completed it, players will gain a huge amount of appreciation for the story’s complex nature, but some may not be willing to get through the flaws of the game to complete it.